printed on superior quality 300gsm buttermilk laid paper. a ray of divinity will descend as on an altar. The author, occultist and visionary who masterminded the Salons de la Rose + Croix was Joséphin Péladan (1858-1918). 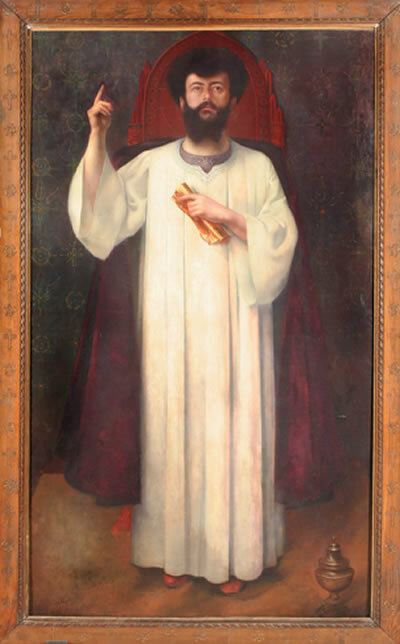 He organised a further five Salons between 1893 and 1897, under the auspices of his organisation The Order of the Rose + Croix of the Temple and the Grail. His purpose was to expose the general public to a form of Symbolist art that would “rip Love out of the Western soul and replace it with the love of Beauty, the love of the Ideal, the love of Mystery.” His grand vision was no less than a spiritual revolution with beauty as his supreme weapon and art as the coup de grâce against the ‘disenchantment of the world’ so prevalent as first the scientific world-view and then the industrial revolution completed their conquest of the Western mind, in an age he regarded as characterized by rampant materialism and futile decadence. 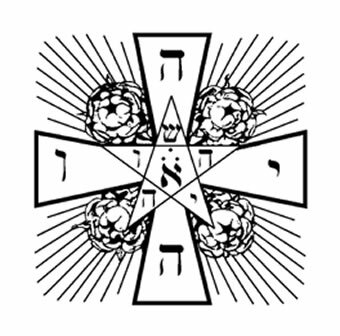 Seal of Péladans and Stanislas Du Guaitas ‘Kabbalistic order of the Rose Cross’ of 1888 which organisation became famous for its magical struggles against the dark mage Joseph-Antoine Boullan, Peladan separated from the OKRC and later formed his ‘Order of the Catholic Temple of the Rose Cross and the Grail’ which formed the foundation of his immensely popular salons. The existing studies of Péladan fall into two main categories; the deeply disparaging, and those that dismiss him as an eccentric, even when acknowledging his impact, as was the case with recent attempts at rediscovering his work in the mainstream art world. It is true that his oeuvre is vast; his prose often turgid and melodramatic. Yet, if one makes the effort to read Péladan on his own terms, as I have documented through many years of research, what emerges is a man with a clear and coherent vision, whose life’s work was an attempt to “build the Temple of Beauty” of which he wrote, and whose every action was tuned to a conscious attempt to disseminate this vision. Péladan believed that through flooding the world with art created according to the principles of spiritual beauty that he taught, society might achieve a new Renaissance and emerge from the swamp of decadence he felt had overcome it. His fixation on the arts, and visual representation, in particular, derived from his belief that humans were created by angels (Elohim) casting their shadow and then tracing its silhouette in order to shape the human form. 27 June 2018 marks the centenary of Joséphin Péladan’s death, and the Les bijoux de Rose+Croix collection represents a celebration of his life and work. It comprises a fresh artistic take on the emblems and frontispiece designs that Péladan commissioned and used in his works, with particular care given to the selection of media and materials. The original designs for these pieces were created by Alexandre Séon (1855-1917), François Mérintier, and Félicien Rops (1833-1898), all of whom worked closely with Péladan for many years. Sasha Chaitow has rendered these designs freehand, adding her own design, colour, and textural elements, whilst staying true to the symbolic and aesthetic qualities of the originals. First done in pen and reproduction antique inks on handmade deckle paper, the original miniature paintings were then tipped in hand-marbled paper and mounted on wood. The original finished pieces were sealed with several coats of varnish to produce an enamel-like effect that nonetheless retained the paper texture. The finished pieces resembled jewels through their vibrant colouring, texture and weight. This collection of high-quality prints includes 15 works from the “Bijoux” series, produced onto 300gsm buttermilk laid paper especially to mark the centenary. Accompanying historical and biographical booklet by Sasha Chaitow, printed onto laid buttermilk paper, hand sewn with purple ribbon to match the binding of the portfolio. Frontispieces by Francois Mérintier, Alexandre Séon, and Félicien Rops. The tiger crest on the left was used as the blazon for the Outer order of L’Ordre de Rose+Croix du Temple et du Graal. The frontispiece in the centre was used for all the theoretical works in Peladan’s Amphitheatre des sciences mortes, as well as the catalogues for the Salons de la Rose+Croix. The third frontispiece belongs to Peladan’s debut novel, Le vice suprême. 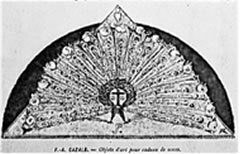 From left to right: Sphinx emblem by Félicien Rops used on the frontispiece of many of Péladan’s early novels. The legend reads “Vives Unguibus et Morsu” (Live under her tooth and claw). (Thought, Beauty, Science) as promoted by Péladan. 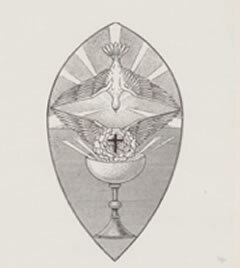 The Seal of the Grail used by L’Ordre de Rose+Croix du Temple et du Graal. Designed by Francois Mérintier, 1893. “Objets d’art pour cadeau de noces” in Supplement a la Plume du 15 décembre 1895. Original satyrical design by Frederic Auguste Cazals (1865-1941). Sasha Chaitow MA Western Esotericism, MA English Literature, PhD Cultural History, is a British-Greek artist, author, and independent scholar. Her work on Joséphin Péladan is the result of her PhD research (University of Essex, 2014), focusing on a close re-examination of his life and work. It comprises a full-scale review of his work in the context of the history of Western Esotericism, featuring an exploration of his intellectual history and the crossover between art, literature, and esoteric thought. Her interests involve the interdisciplinary study of the relationships between esoteric philosophy, art, and wider culture. She initially trained in art alongside established Corfu artists, followed by studies in the Fine Arts Department of VAKALO School of Art in Athens. Between 2000-2009 she held 6 solo exhibitions in Corfu and Athens. From 2009 she focused on academics, continuing to paint intermittently. After being awarded her doctorate in 2014, she returned to full-time painting and established ICON Gallery in the old town of Corfu specialising in mythic, symbolic, and spiritual art and providing a showcase for over 35 local artists. In 2015, at the invitation of Gothenburg University, she held an exhibition and lecture tour in Sweden. Her 2016 collection Saving the Lives of Angels was inspired by Péladan’s teachings and exhibited in London and Northampton in the context of the Trans-States Conference at the University of Northampton. In May 2017 she exhibited a collection of original neo-symbolist art, Stained by the Light in Corfu, and again in Glastonbury in October 2017, alongside the ART=PRAXIS symposium. Sasha produces several capsule collections of art each year, often closely related to her scholarship. The Les Bijoux de Rose+Croix collection is her first collection for 2018. Writing In Greek she has published the monograph Searching for Josephin Peladan (Daidaleos Pub., 2013; Alloste Pub., Athens 2016); a layperson’s introduction to his life and work in the context of the Belle Epoque and the French Occult Revival, and book chapters in collective works by Archetypo Publishing. For a number of years, she wrote articles for the Greek national and periodic press. Outside Greece, she has published a number of academic papers and chapters in various peer-reviewed journals and books (USA, Sweden, Spain, Holland). She is currently working on the revision of her PhD thesis for publication with Brill Academic Press and is preparing further works on Joséphin Péladan with a UK publisher.